Shake with ice and strain into a rocks glass containing 3 ice cubes. Top with 2 oz of Notch Session Ale and add straws. Two Wednesdays ago, I ventured over to Brick & Mortar where Matthew Schrage and Phil MacLeod were tending bar. For a drink, I asked for the Blackheart off the menu for this beer cocktail had a pirate-y feel and both Batavia Arrack and beer as ingredients are big draws for me. The Blackheart's allspice and lime notes greeted the nose. The citrus continued into the sip where it mingled with the beer's crisp carbonation. 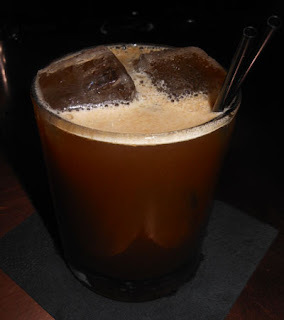 The swallow presented the Batavia Arrack that was smoothed over by the molasses, and it ended with an allspice finish from the liqueur and bitters.